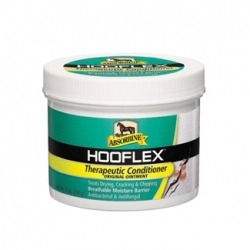 Hooflex Therapeutic Conditioner Ointment is a unique formula that helps main the pliability of the entire hoof by providing conditioners necessary for long-lasting moisture balance. Contains antibacterial and antifungal agents to help prevent infections. 25oz. jar with screw-top lid.